So, some of you might have seen my little rant post about someone commenting foul comments on my blog. Sorry if it appeared like I was going a crusade, really wasn't meant to - just felt it's a topic that needed to be addressed, for myself and for some of my other bloggers friends who I know have the same problem. Any way, here is a little outfit post taken of me in the office the other day. It's a mix of old faithfuls and some new bits, and a new colour for my wardrobe - pink. My over the shoulder bag was bought after a mass hunt last week, I finally decided on the Carven style from Vestiaire Collective - thrilled with it considering it was just over £100. The jumper is an old faithful from Rag and Bone (adding to my white knit obsession) which I bought in the sales a couple of years ago. I cannot explain how warm it is which is handy as it's effing freezing which while we're on the subject: has anyone else's skin and hair gone a little mental? I've been using Sassoon Salon's Diamond Polish most days just to put a bit of life into my hair, really recommend. The skirt is a "new in" from Whistles. Last year I realised midi skirts were my friend and have acquired a few of them. This one is a new favourite, I never thought I would get into pink but for Whistles I'll take an exception. I'm also obsessed with the Pink Lady style bomber, I popped a pic up of Lopez and I pounding the streets when I was wearing it here. The boots were a gift from the lovely guys at Surgery PR, from Seven Boot Lane who hail from the UK in Somerset. If I was better at #todayimwearing posts you'd have seen quite how much wear I've got out of them... Super comfy from day one and perfect for everyday wear. 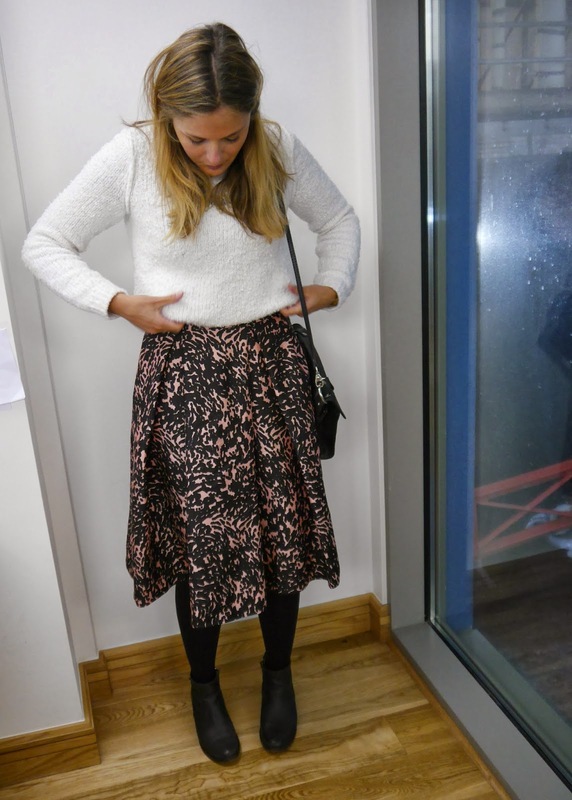 For me this outfit is perfect for the weather, cosy but putting a skirt on somehow instantly makes you feel office-acceptable-smart. How are you keeping your clothing moral up in this gloom? Liking the skirt, good length and you can afford to go muccch pinker! Totally just have to ignore the haters. Some people are so stupid and not worth the least bit of time. Absolutely love this outfit on you. The skirt is so pretty and I adore the shape. Looking very chic indeed.